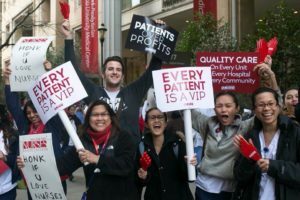 In late fall of 2018, nurses from five private New York City hospitals in three competing hospital systems delivered their contract proposals to management. Born from a protracted gestation of surveying democratic priorities and tracking experiences with the previous contract, . . .
Johanna Brenner (JB): On February 21, Oakland’s 3,000 teachers went out on strike after two years of failed negotiations with the Oakland Unified School District. Clearly, the strike got the District’s attention and a deal was won after teachers held . 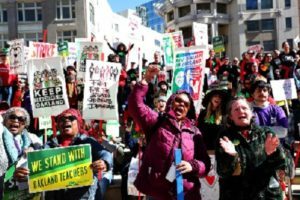 . .
Editor’s note: This article responds to analysis New Politics has already published on the Oakland teachers’ strike. In hosting different viewpoints on the strike, New Politics continues its tradition of opening its pages (and now its website) to debates about . . .
An Election Challenge: Time for Change at NewsGuild? 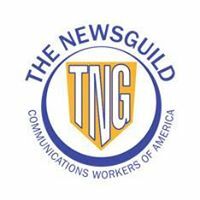 The 21,000-member NewsGuild, an affiliate of the Communications Workers of America (CWA), is a rarity in organized labor. It’s one of the few national unions that lets all members vote for its top officers, instead of choosing them at a convention . . . Momentum for building a post-neoliberal U.S. has been gaining strength with each passing day. However, despite the rise of new and exciting figures, such as Alexandria Ocasio-Cortez and the tide of striking teachers in even GOP dominated states, we must remain aware that whenever there has been potential for revolutionizing government and politics, there has always followed a reactionary and brutal backlash. 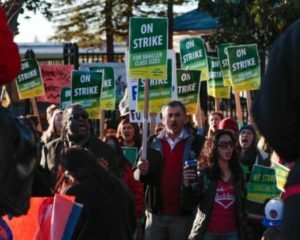 Oakland teachers’ strike: Balance sheet, lessons, and what next? 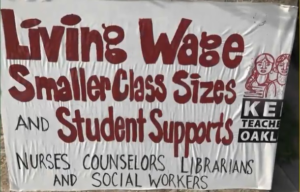 Jack Gerson, retired Oakland teacher and former executive board and bargaining team member, analyzes what occurred and why in the Oakland teachers’ strike. 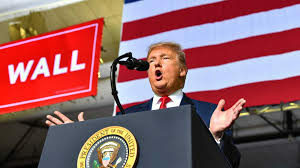 Socialists must organize a national movement against Trump’s national . 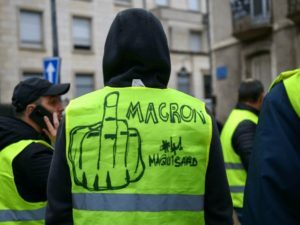 . .
On Tues, Feb. 5, as the Macron government pushed harsh repressive laws against demonstrators through the National Assembly, the Yellow Vests joined with France’s unions for the first time in a day-long, nation-wide “General Strike.” . . . 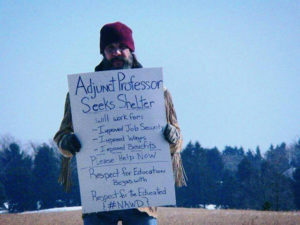 There are many with college degrees who endure insecure working conditions and are poorly compensated. They include part-time teachers in institutions of higher education. 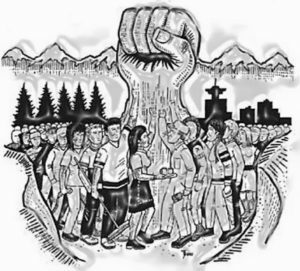 It is a very good time for socialists and other union and left activists to take a step back and take a deeper look at some of the structures and dynamics of unions under capitalism. Ten years ago this month, the Service Employees International Union (SEIU) shot itself in the foot, big time. In January 2019, a massive strike of over 30,000 public school teachers stunned the Los Angeles power structure when it received massive, almost unanimous public support, especially in the city’s large Latinx and Black communities. Latinx students now make up . . . 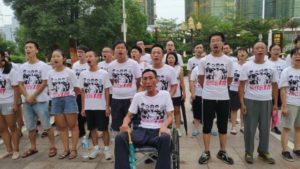 The Jasic case, in particular relationships that were forged between students and workers, reveals important developments in China’s politics. 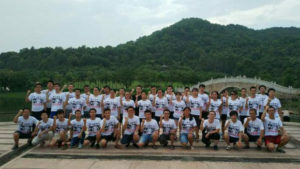 The central problem was the blatant violations of workers’ rights and interests by both the Jasic employer and the Chinese government, including the country’s only official trade union organization, the All-China Federation of Trade Unions (ACFTU). 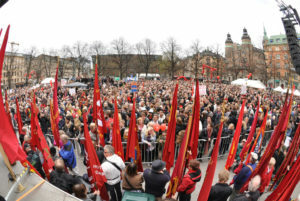 Why no socialism in Sweden? The Wage-Earner Funds in Sweden is one of the few serious attempts in an advanced capitalist society to socialize the means of production. Developed by Rudolf Meidner and Anna Hedborg, two economists at the powerful social-democratic union confederation LO, the . . .
Who ended the shutdown? The Democrats? Nancy Pelosi? 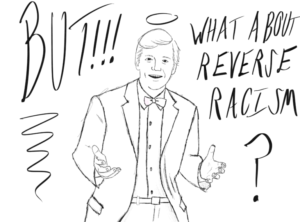 Mitch McConnell? None of the above. 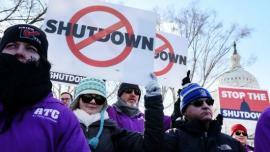 The shutdown got shut down when workers took Laguardia Airport off-line on Friday, January 25. A rolling disaster of massive commercial disruption was about to unfold for . . . 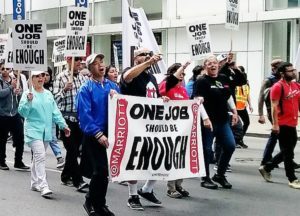 Organized labor has an opportunity to play an important role in the upcoming selection of a presidential candidate in the Democratic Party’s primaries and the eventual November 3, 2020 U.S. presidential election. The stakes couldn’t be higher, not only for . . . 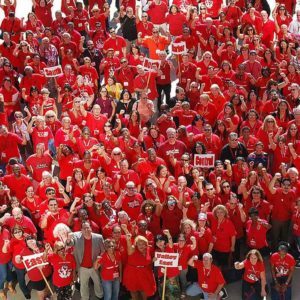 The United Teachers of Los Angeles (UTLA), the city’s teachers union, has now reentered negotiations with a school board chastened by a strike that has shown the movement’s political power in massive demonstrations with community members and parents. The January 14 strike date announced by the United Teachers of Los Angeles (UTLA) has heightened tensions in an already contentious dispute with Los Angeles Superintendent Austin Beutner, who represents the Los Angeles Unified School District (LAUSD) in negotiations. However, far more is at stake in Los Angeles and for the rest of us than a traditional contract struggle. Rob Walsh, originally from a small town just outside Utica, is a material handler at the Tesla plant just south of Buffalo, New York’s downtown—dubbed Gigafactory 2—and part of the joint United Steelworkers/International Brotherhood of Electrical Workers organizing committee. One of plant’s earliest hires, he works 12-hour shifts three to four days a week, making $16.50 an hour. He is one of roughly 400 employees that work around the clock at the plant producing Tesla’s solar roof tiles. During those shifts, Walsh delivers production from the warehouse to the floor and then takes the finished product out to be shipped.